Detroit vs Addiction and the American Medical Association Medical Student Section, two student organizations of the Wayne State University School of Medicine, recently joined forces in the Mazurek Medical Education Commons to co-host a workshop on naloxone, the synthetic drug that can be administered to someone overdosing on opioids like heroin and morphine. "There is no easy solution to ending the opioid epidemic. Our goal is to help train a new generation of physicians who are better equipped to recognize and take care of individuals with substance use disorders," said Jody Chou, a second-year medical student and president of Detroit vs Addiction. "It is critical for health care providers and the community to work together to solve this complex public health crisis." The medication blocks opioid receptor sites, reversing the toxic effects of the overdose. Last March, White House officials unveiled a plan to combat the opioid crisis, including arming more first-responders with naloxone kits to treat overdoses. The drug has reversed at least 26,500 overdoses between 1996 and 2014, according to data from the National Institute on Drug Abuse. Students with Detroit vs Addiction regularly volunteer at New Light Recovery Center, where they witness medication-assisted treatment, observe physician-patient interaction, sit in on counseling sessions and learn about medication dosing. "In addition, our outreach team has been working with the emergency department at Detroit Receiving Hospital to identify buprenorphine/naloxone providers in the area, design pamphlets containing the list of providers and distribute them for patients and their families to utilize," Chou said. WSU's Jan. 10 workshop, supported and presented by the Detroit Wayne Mental Health Authority, proved popular even before it started - its 60 open slots filled two minutes after the event was announced. Each attendee received a free naloxone kit provided by DWMHA. "The popularity of this event was an extremely positive indication of students' engagement with learning the skills needed to help individuals in our community who are often marginalized and underserved," said Tabitha Moses, an M.D.-Ph.D. student who serves as Wayne's national delegate to the American Medical Association-Medical Student Section. She is also a student advisor to Detroit vs Addiction. "During the training, we heard stories of instances when students already had used naloxone or wished they were equipped with it. As a result of the success of this event, we are working to find a way to make this training available to more students at the medical school in the future," Moses said. Attendees learned the scope of the opioid epidemic, how naloxone works, how to use it, how to recognize signs of overdose, how to respond in an overdose situation, and how to log naloxone usage and receive a new kit if used. Mara Darian is a first-year medical student and AMA member who attended the training. "The opioid epidemic is a topic of concern in the medical community and a public health crisis. Therefore, an opportunity to put this discussion into practice by learning how to respond to an overdose was exciting to medical students. As student doctors, it is important to us to be prepared to save a life, whether in the hospital or in the community." The training is part of the Michigan State Medical Society Medical Student Section's community service and outreach initiative. 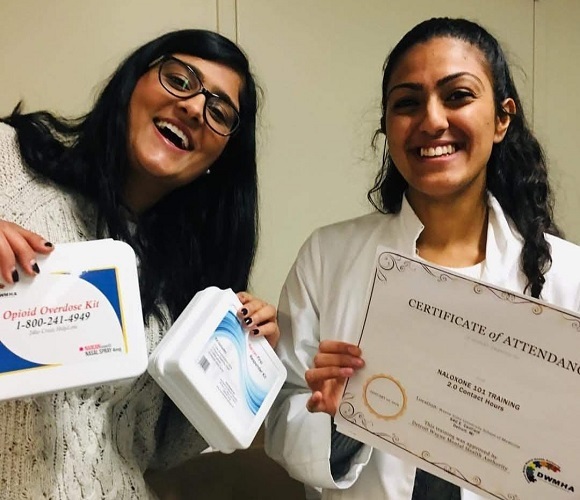 "Ultimately, providing medical students with naloxone and other emergency care training not only furthers our professional development, but prepares us to better serve our community when it needs us," Darian said.